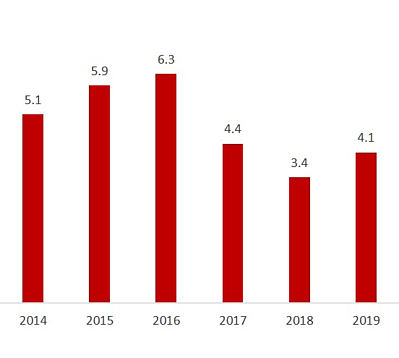 There were several significant changes that impacted the 2019 OEP. 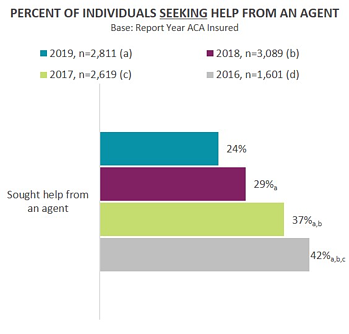 Overall, there was a decrease in switching activity, decrease in individuals seeking help from an agent, and decreased or minimal increase of premiums for consumers. Market conditions were favorable for health insurance carriers to re-enter markets or expand into new markets. 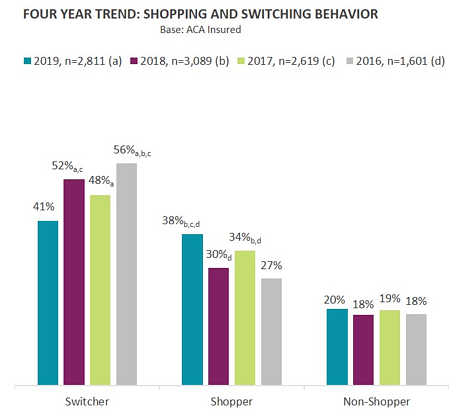 Nearly 80% of ACA consumers shopped or switched in 2019, which was similar to the overall level of consumer activity in 2018. However, the overall switching hit a four-year low and is down a significant 21% relative to 2018. Plan switching outpaced carrier switching for the first time which is a sign of market stabilization. Regarding your enrollment for 2019, which best describes your experience? What was your decision regarding your 2019 health coverage? There has been a gradual decline in the number of consumers seeking help from an agent over the last four years. The decrease in individuals seeking help from an agent may be due to the elimination of sales incentives for agents. This is another sign of market stabilization since consumers who do switch tend to speak with an agent. Current analysis shows that average premiums have changed little from last year. Average premiums for platinum and silver plans have increased slightly (under 5%). Average premiums for gold and bronze plans have decreased slightly (also less than 5% difference from last year). Monthly premiums continue to be a top concern in evaluating plans. However, levelling off of premiums over the last year may be a sign that health insurance carriers have settled on a pricing strategy that makes this market profitable. With signs of stabilization in the ACA market, carriers are no longer exiting the market in droves. In fact, more carriers are participating in the federal exchanges. Deft’s analysis of the state exchanges using the Federal marketplace shows an increase in the number of carriers participating, reversing the previous two years of significant declines. New entrants such as Oscar and Bright Health and expansion into new states by regional players such as Medica has expanded choice and increased competition in many markets. Source: Deft Research 2014-2019 QHP landscape files. Excludes states not operating on Federally Facilitated Marketplace. With the repeal of the individual mandate, consumers are not forced to switch due to plan discontinuation. This also attributed to the lower switch rate and stabilization of the ACA market. Affordability for many consumers remains to be a challenge and how this void is filled remains to be seen. Learn more about the latest syndicated research studies.